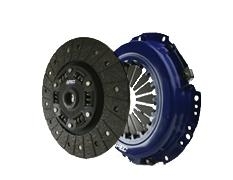 Spec Clutches are great alternatives to the stock clutch for performance applications. With higher torque holding power the Spec Clutch outperforms stock for your modified Porsche. The SPEC Stage 1 Clutch Kit features an integrally molded carbon kevlar-based, high performance organic lining that offers smooth engagement and excellent life. This lining has an integrally bonded steel backing for strength under high clamp loads and temperatures. The hub is double sprung with spring cover relieves for flexibility and heat treated components for strength and durability. Best for street and many track/off-road applications. The SPEC Stage 3 Clutch Kit features a carbon semi-metallic 6 puck sprung hub or rigid disc (depending on application) that has been the leading puck clutch in drivability, life and torque capacity. This unit is designed for street and race cars that require an aggressive but streetable engagement and high torque capacity. The hub is double sprung with spring cover relieves for flexibility and heat treated components for strength and durability. Also available in 3 puck configuration. Great for street, drag, road racing, pulling, rallye and drift. The SPEC Stage 4 Clutch Kit is a solid hub version of the stage 3. The hub is solid 8-rivet and the assembly is heat treated for strength and durability. It is available in a 3, 4 or 6 puck configuration. Use the 3 puck for the lightest option or the 6 puck for the smoothest engagement. The 4 puck is a good compromise for both. Street drivable in 6 puck configuration, but not street friendly due to the rigid hub. Best for drag racing, road racing, pulling, rallye and drift. The SPEC Stage 5 Clutch Kit features a full-metallic disc with the highest possible friction co-efficient. Street drivable but not street-friendly. The hub is solid 12-rivet and the assembly is heat treated for strength and durability. Best for extreme street and drag racing.